Please, fill in the required information and we will get a quote back to you as soon as possible. We will require a sample from you, If you are matching an existing system. These folders will be resold. The minimum order size for tinting is 3000 folders. All printing must be approved by signature of customer before production can begin. One color outside or inside. One color outside and inside. 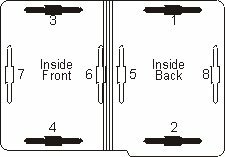 Positions of fasteners on front and back panels will be repeated on appropriate side of each divider. All labeling systems must be approved by signature of customer before production can begin. System is straight numeric with double digit label for 1's and 10's. Clear, flexible plastic pockets applied to user specified location inside or outside folder. The first dimension in the listing is the opening size.